The moment you begin typing, KeyScrambler instantly begins encrypting each character at the keyboard driver level, deep in the Windows kernel. The timing and the location make it difficult for keyloggers to bypass KeyScrambler's encryption. Your keystrokes remain encrypted as they travel through the perilous path in the operating system, where keyloggers can be physically or remotely installed on your computer to intercept your keystrokes. We've implemented both standard symmetric-key encryption (Blowfish 128-bit) and asymmetric-key encryption (RSA 1024-bit) in KeyScrambler. The strong encryption defeats even the most insidious kind of keylogging malware. 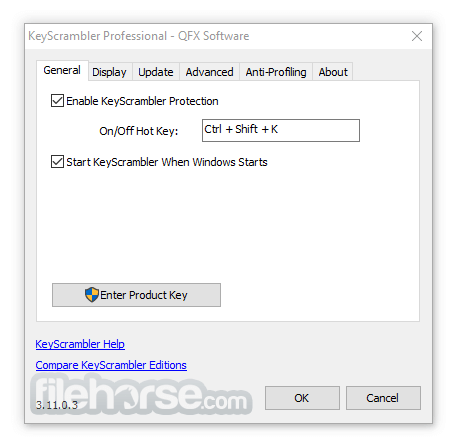 Should a keylogger have wormed into your computer and escaped detection, KeyScrambler will still work, and the keylogger would have only a meaningless jumble of characters to record. When your keystrokes reach the destination app, the decryption module of KeyScrambler goes to work, and you see exactly the keys you've typed. Here the journey ends with your info intact. With a file size of ~1.5 MB, Key Scrambler takes one minute to download, little resources to run, and no user effort. 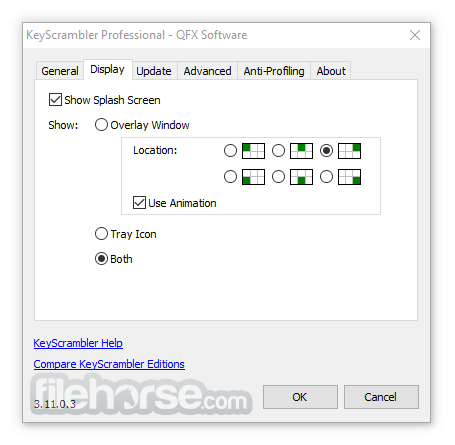 Want to know what KeyScrambler Pro is doing? The unobtrusive Overlay and the tray Icon on your screen keep you in the know and give you peace of mind. 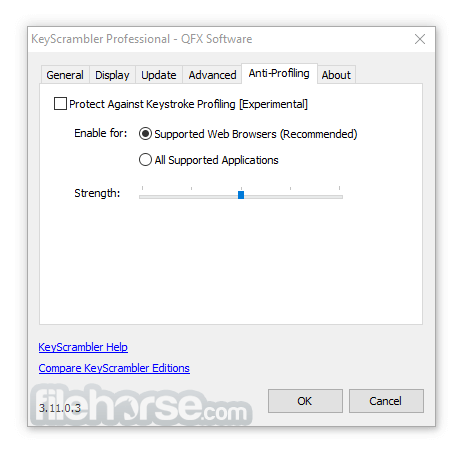 KeyScrambler's capability to effectively foil attacks by new, in the wild keylogging malware and to work seamlessly with most security programs makes it an invaluable tool for online information security. Note: You cannot turn KeyScrambler Professional on.